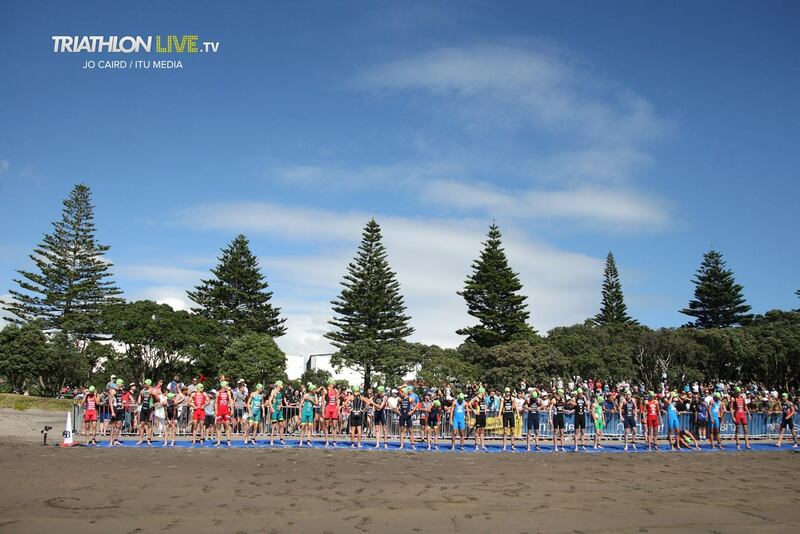 Ngamotu Beach, New Plymouth, set the scene for the third stop on the World Cup tour. 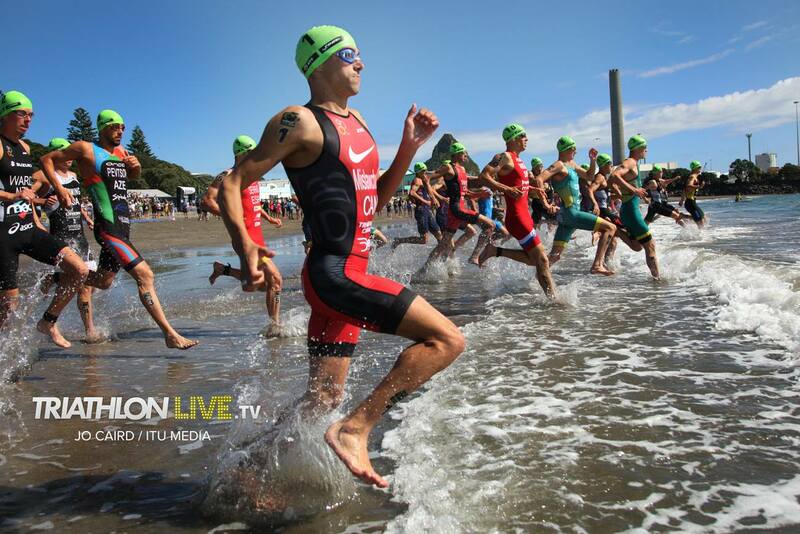 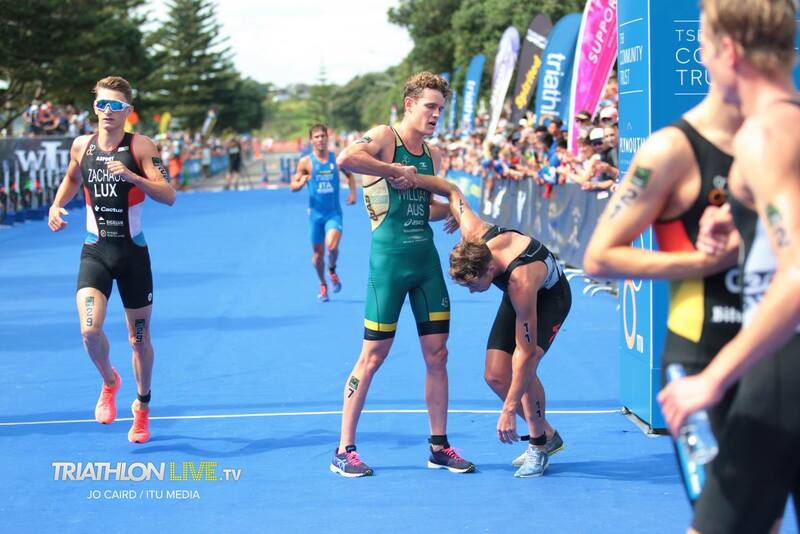 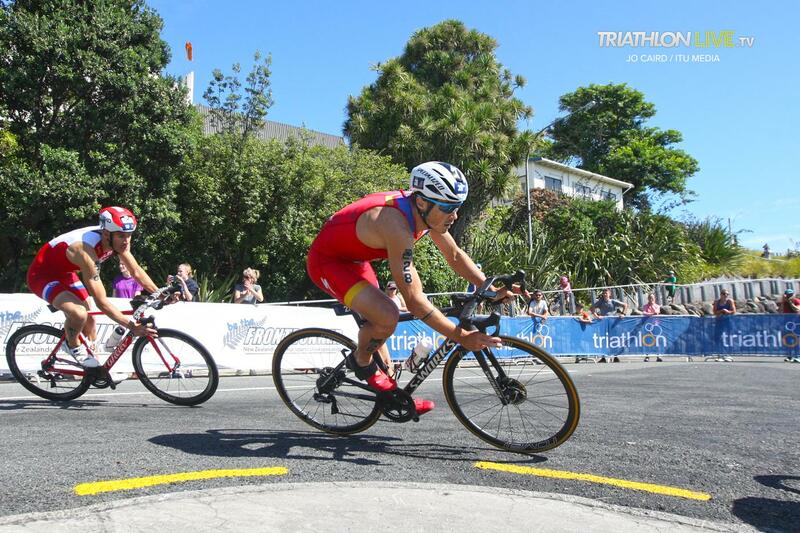 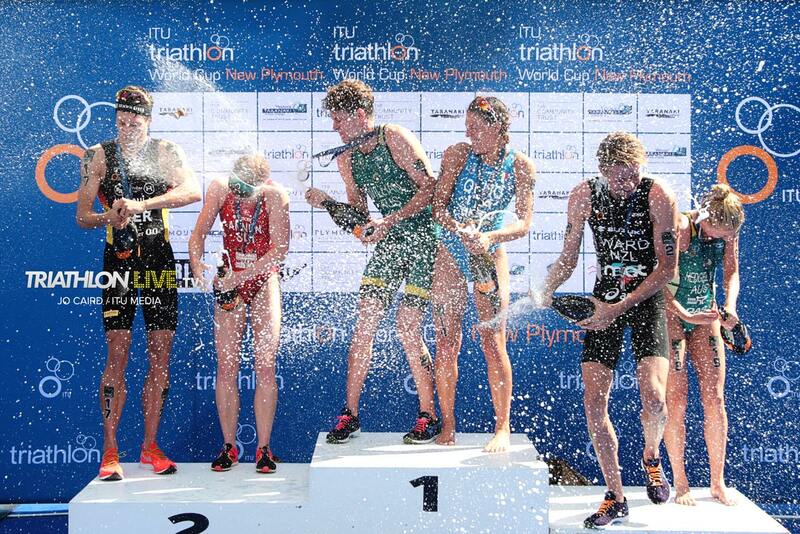 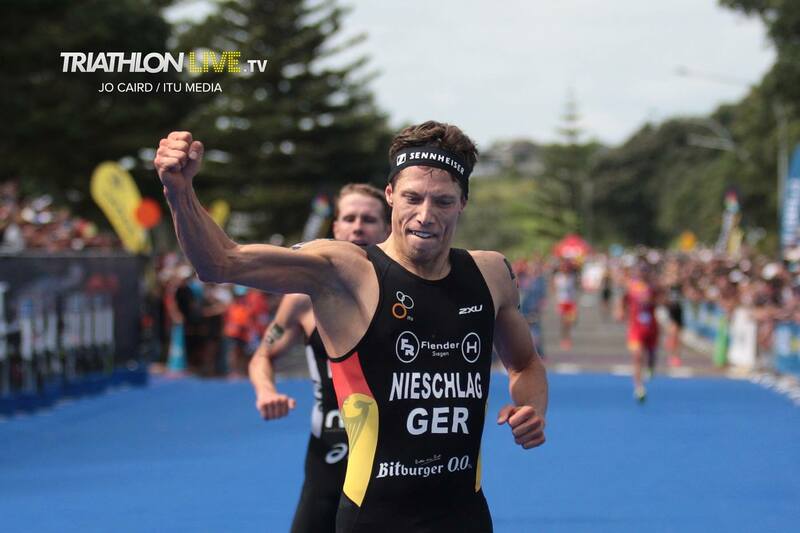 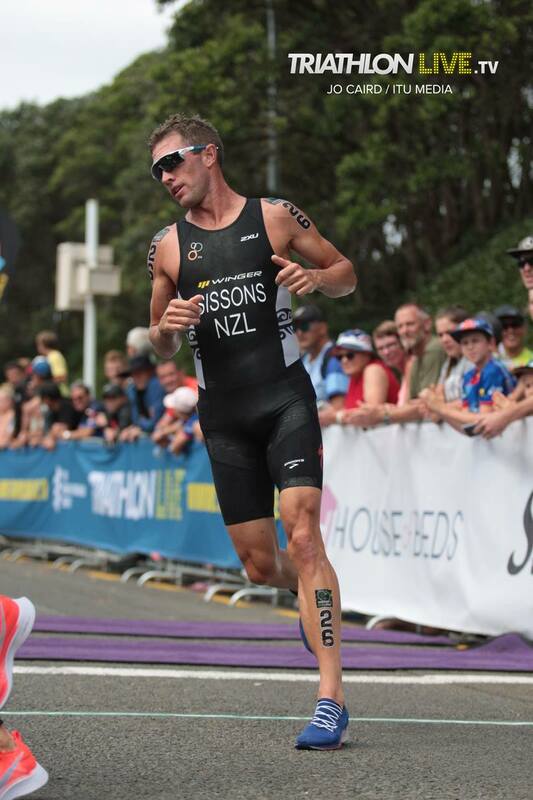 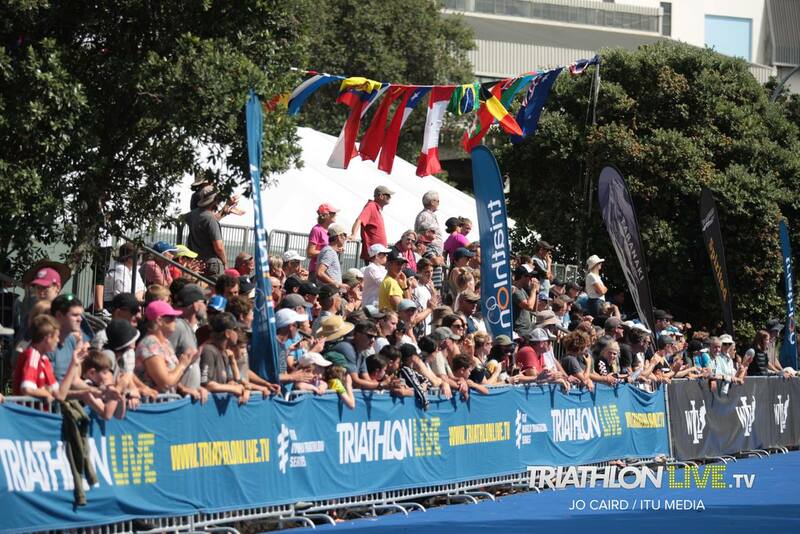 Fields of experienced athletes lined up for battle, to attack the 2019 New Plymouth Triathlon World Cup. 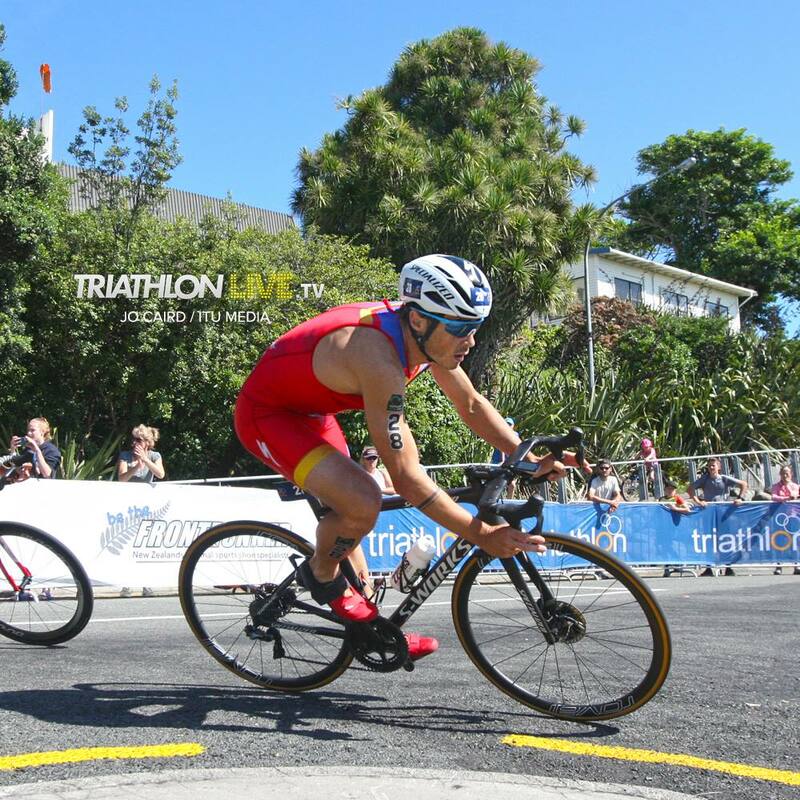 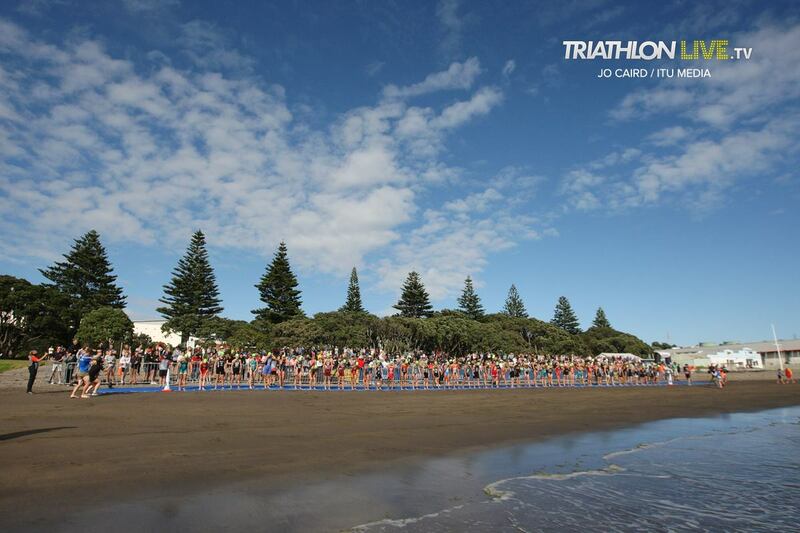 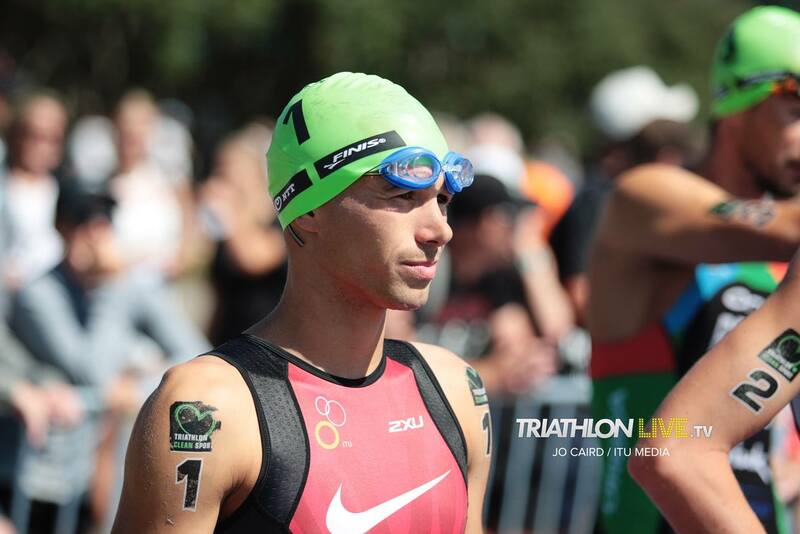 Conditions were ideal for race day, the ocean was whipped with a slight chop for the 750m ocean swim which was followed by a 20km technical bike course and 5km run, taking in the scenic roads of Taranaki. 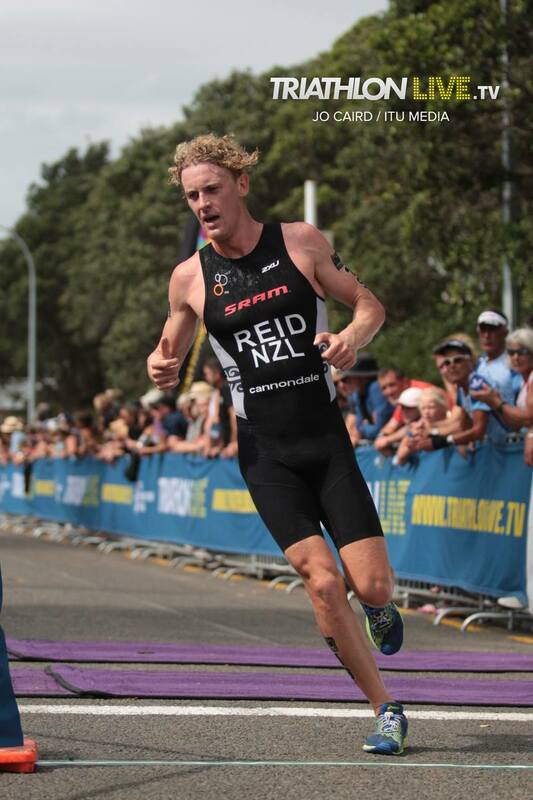 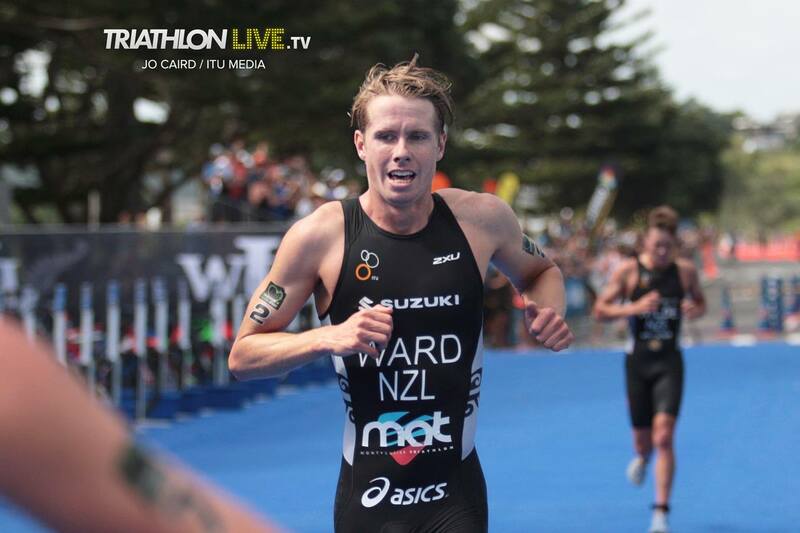 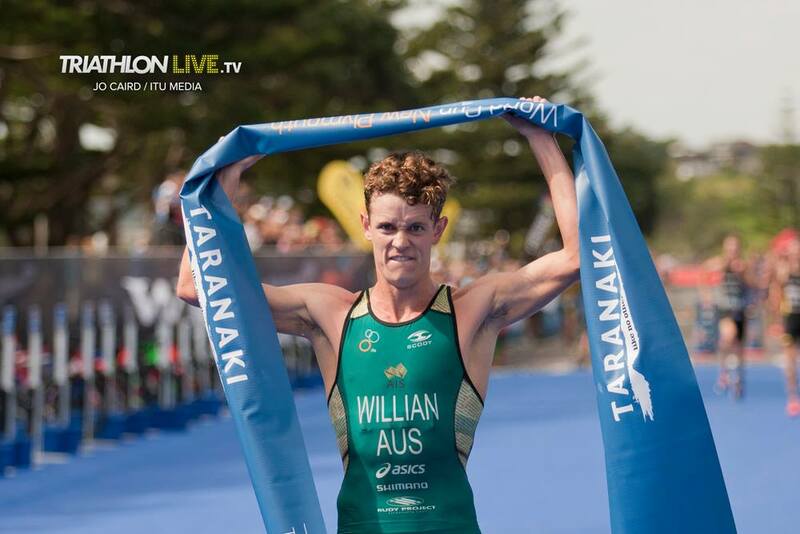 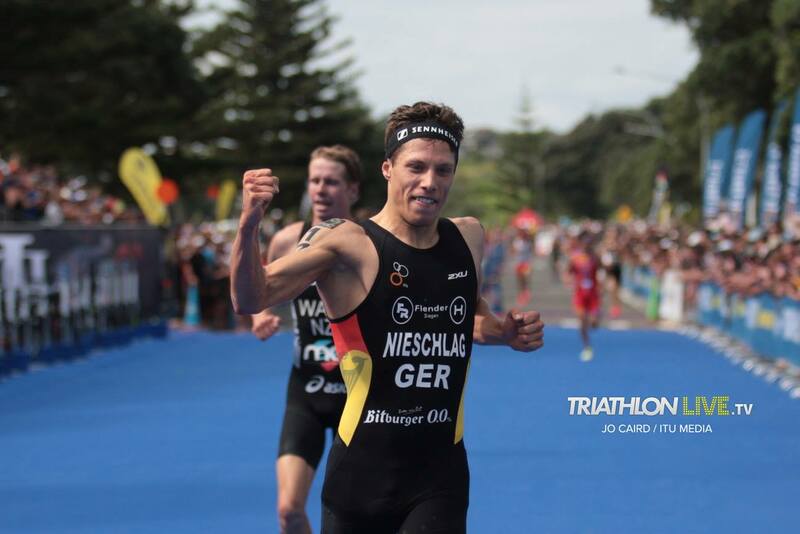 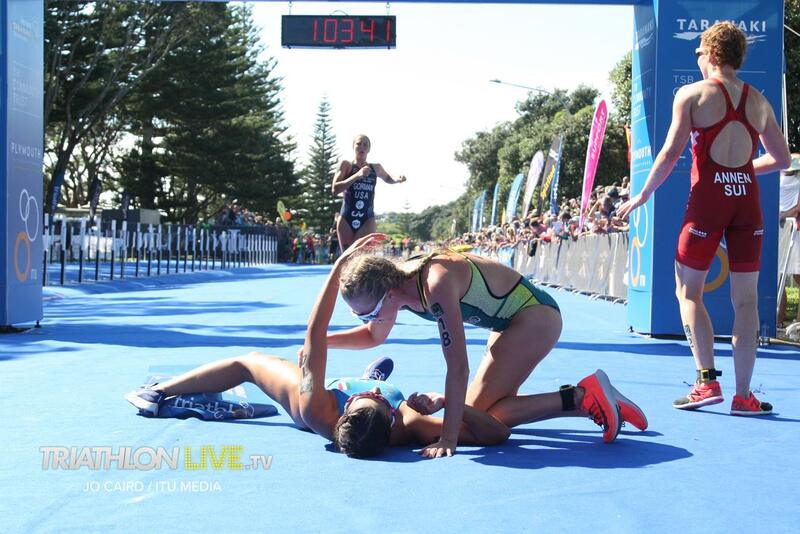 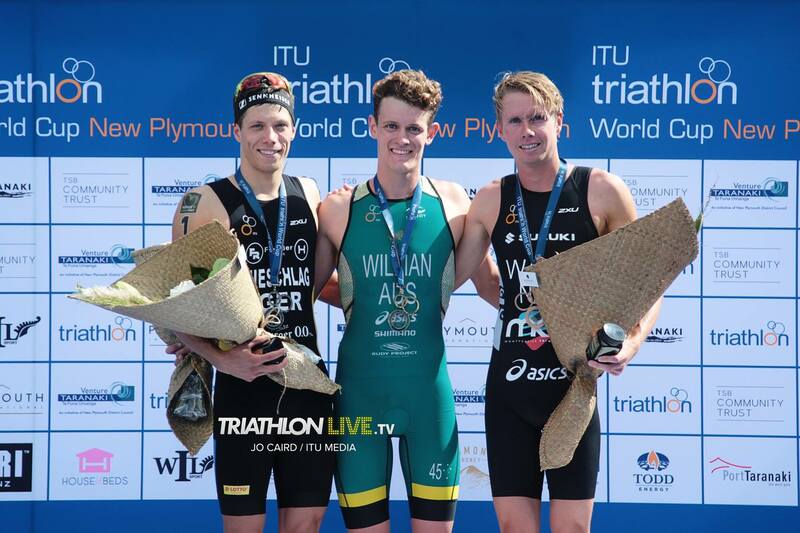 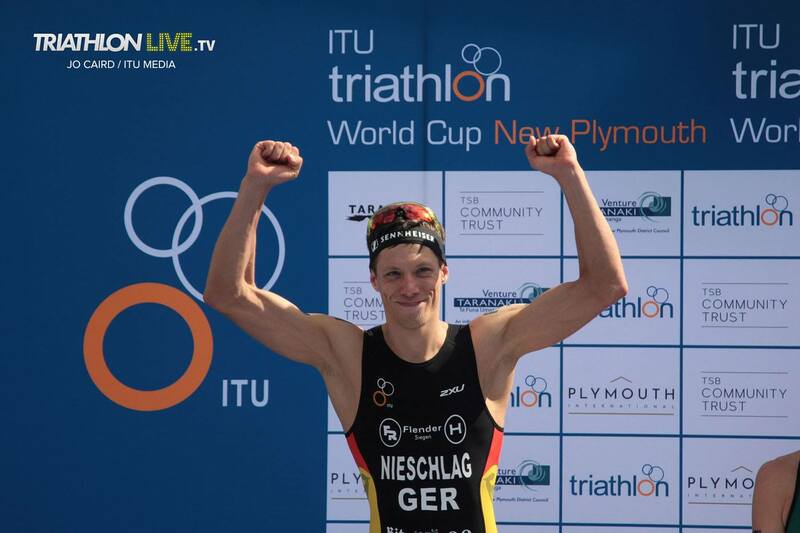 The 2019 world cup formed part of the Triathlon Festival with the New Zealand Schools Championships on the Friday and Saturday and spectator support lined the streets for the world class athletes. 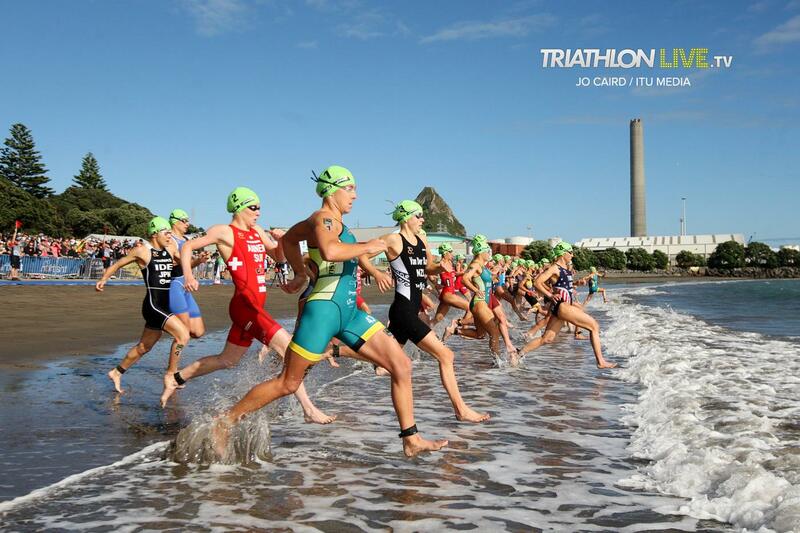 In the women’s race it was no surprise that Australia’s Emma Jeffcoat, remaining true to her top ranking leading into the race, navigated the choppy surf-like conditions and led the field of women through the swim and out onto the sand, for the run up to transition. 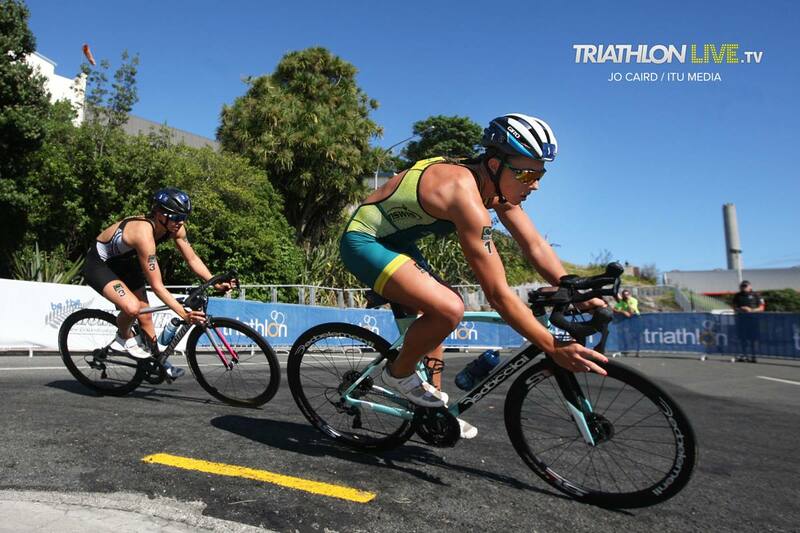 A group of ten women left transition together to enter the hilly bike course, featuring four technical laps. 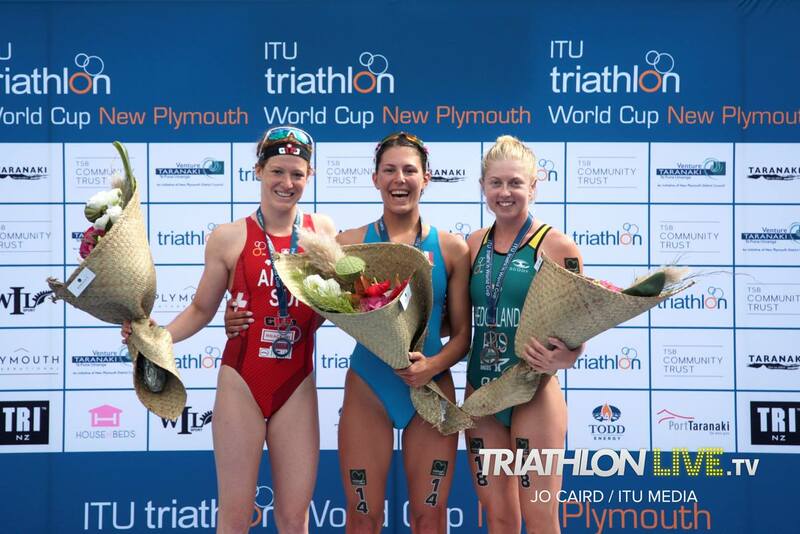 The women took turns out in front seat with the likes of Jeffcoat, Switzerland’s Jolanda Annen, Australian duo Tamsyn Moana-Veale and Jaz Hedgeland, New Zealand’s Nicole Van Der Kaay and Spain’s Miriam Casillas Garcia riding together. 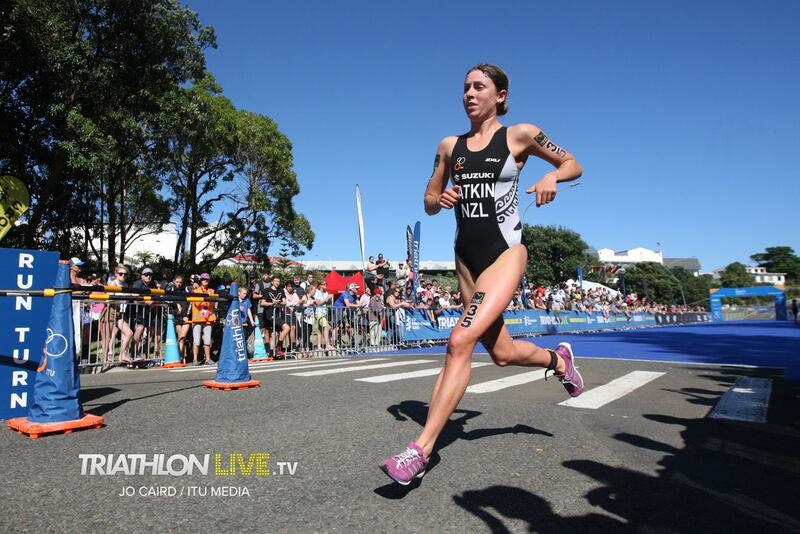 New Zealand’s Sophie Corbridge was working hard to lead the way for the chase group, 8-seconds behind the leading women. 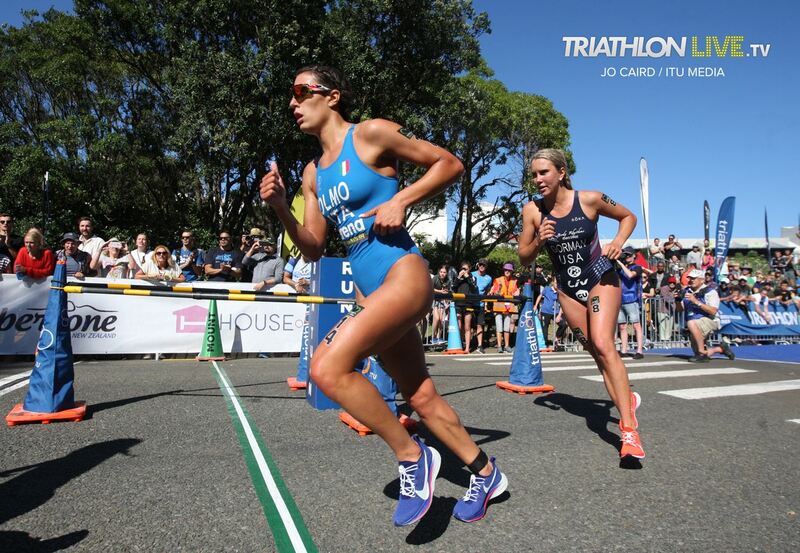 Spain’s Carolina Routier was embedded in this chase bunch. 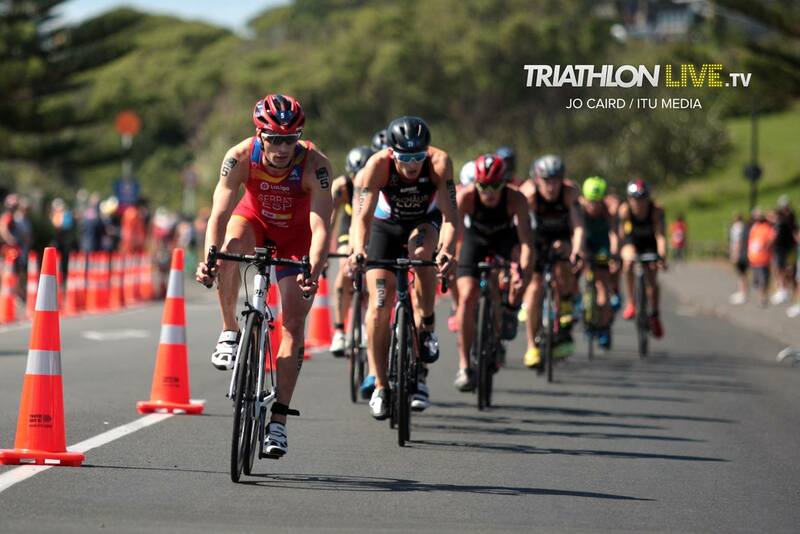 Estonia’s Kaidi Kivioja, was sitting in front seat of the third group, a further 26-seconds down on the race leaders. 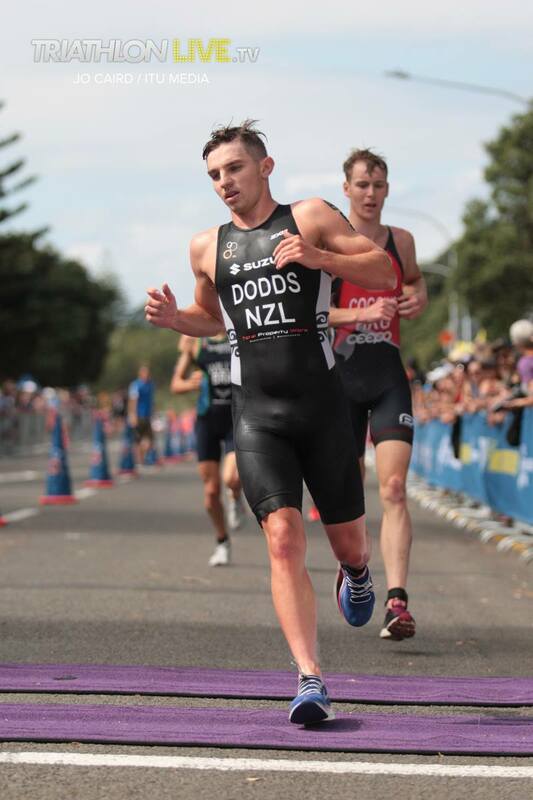 The course in New Plymouth kept athletes honest as they took the turn to climb the hill, looped and made their way back down into the event precinct each lap, testing them physically and technically. 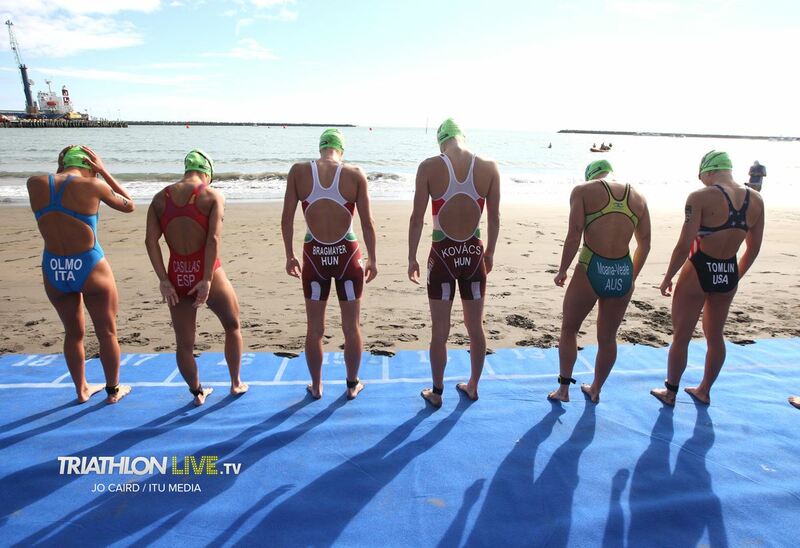 Annen of Switzerland led the group of ten women into the corner and back into transition for the final lap of the bike course. 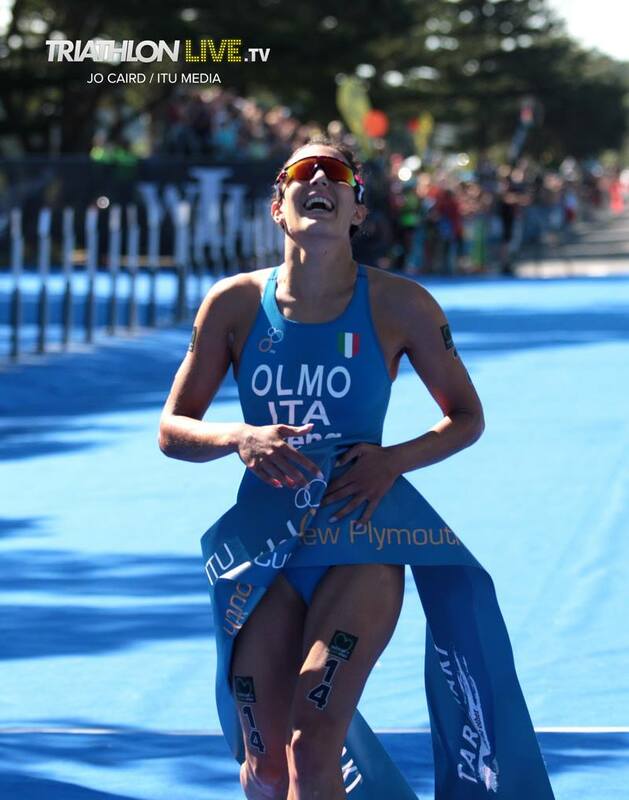 Italy’s Angelical Olmo, Jeffcoat and Van Der Kaay pushed the pace and took turns out in front. 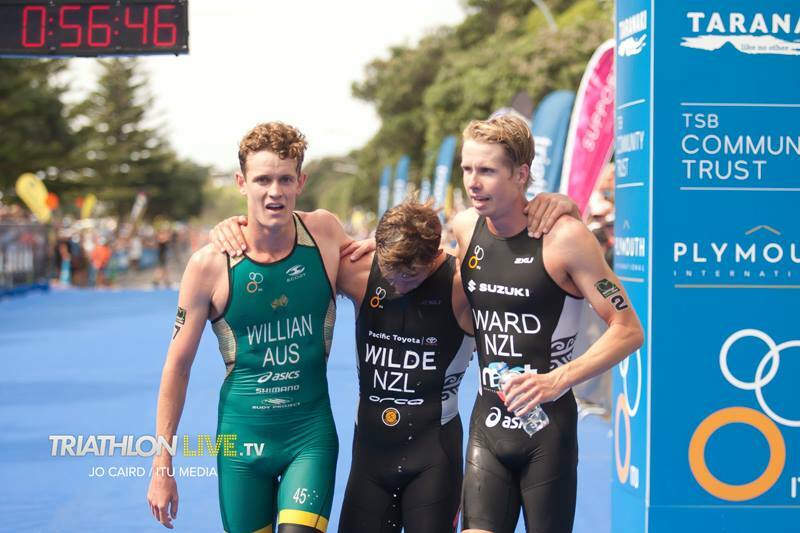 The same group of experienced cyclists stayed together as they took the final hairpin turn of the day and into their second transition, led by Hedgeland who was wearing the green and gold suit for Australia. 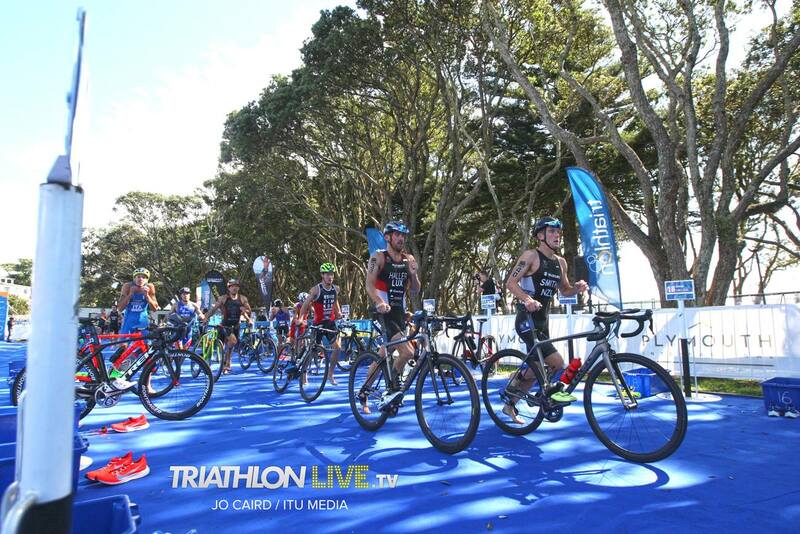 Hedgeland, Jeffcoat and Annen produced the quickest transitions to hit the pavement for the final stage of the race. 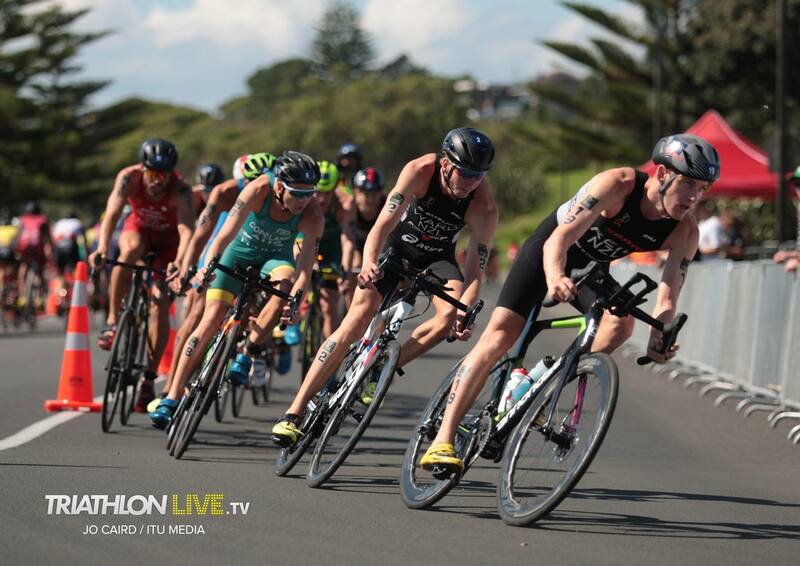 The chase group entered transition with a 37-second gap on the front runners. 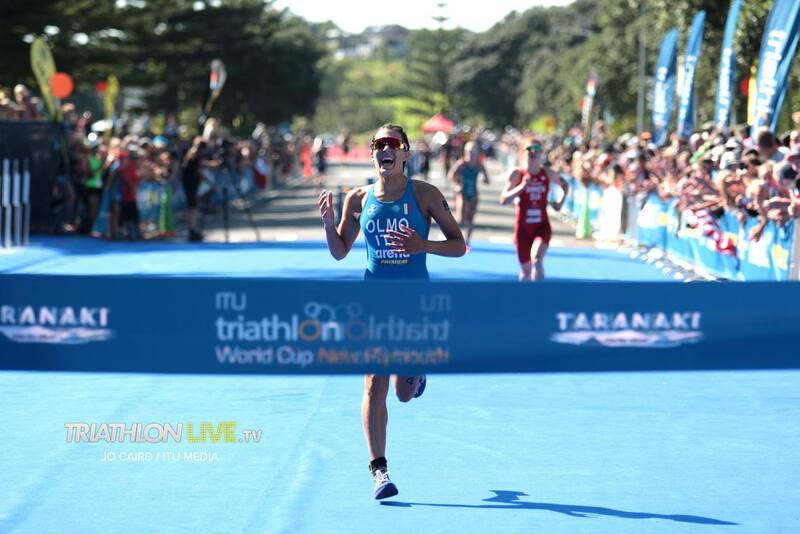 The lead group was made up of strong runners including Olmo, Van Der Kaay and the experience of Barbara Riveros from Chile and Tamara Gorman from the US triathlon team. 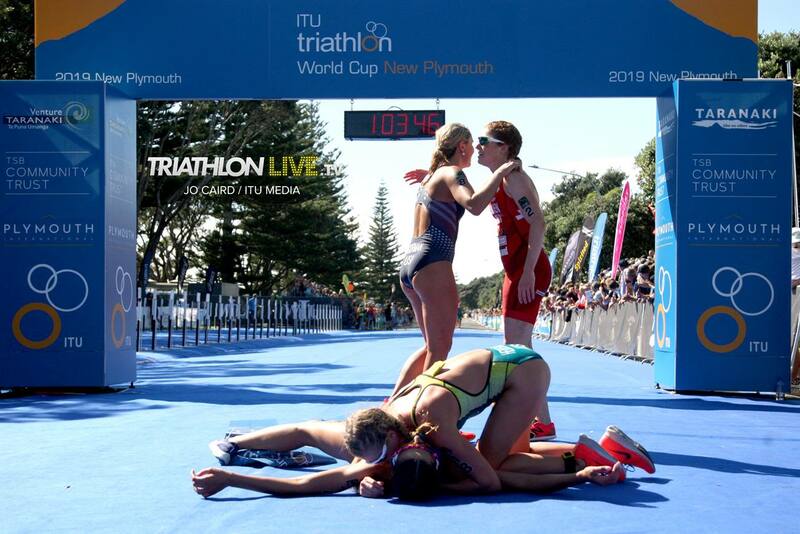 The battle was on and it was obvious that the podium spots would be awarded within this group of leading women. 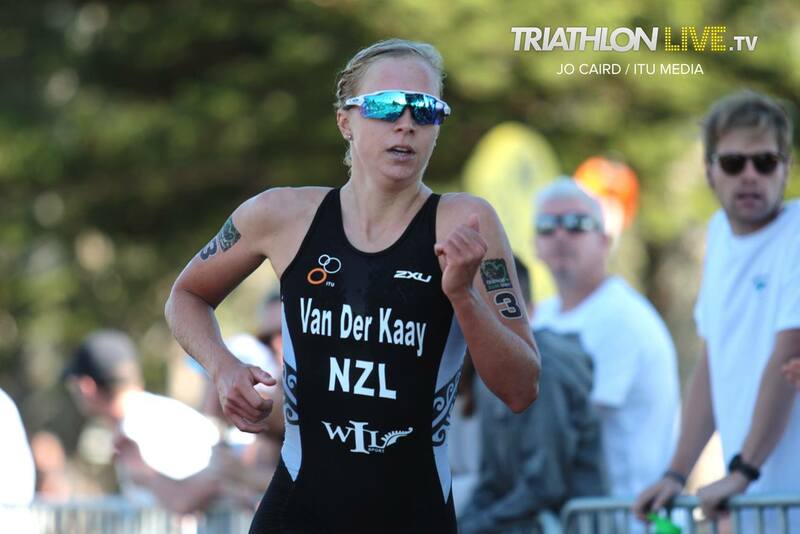 Jeffcoat lost grip of the lead group in the last stage of the run and Van Der Kaay also pulled back the pace but held onto fifth position. 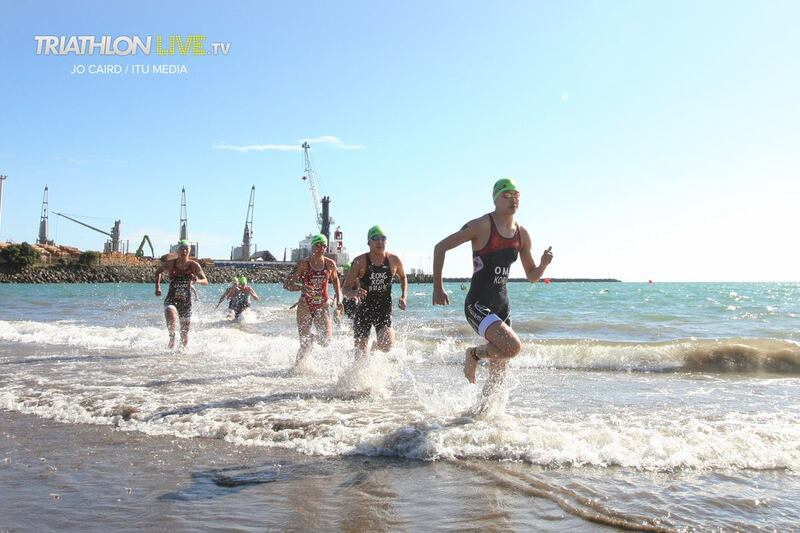 The leaders made the final turn of the course and it was Olmo, Annen, Hedgeland and Gorman who were in charge together. 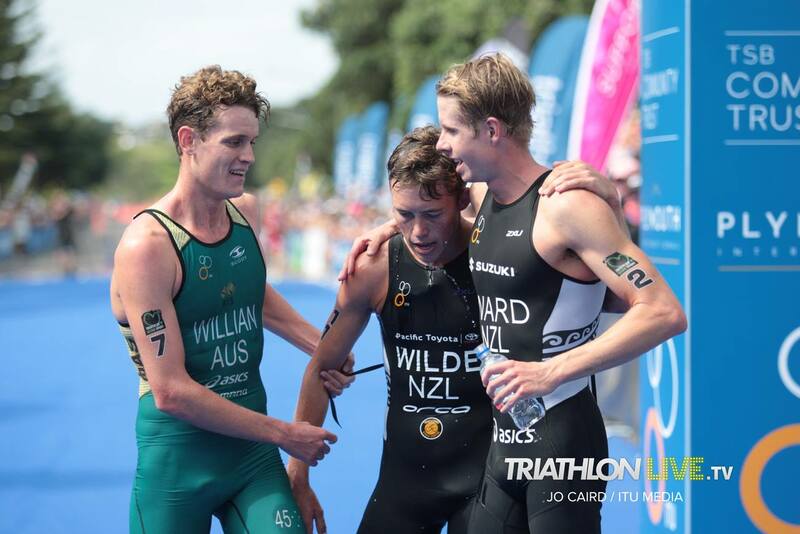 With only three medals to award, the race for podium contention was not yet established. 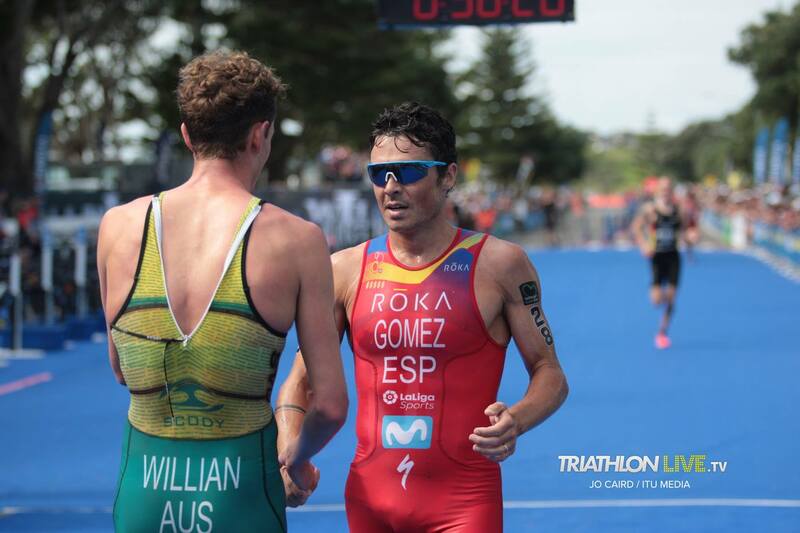 Olmo finally made the bold move and extended a gap to lead by a few seconds. 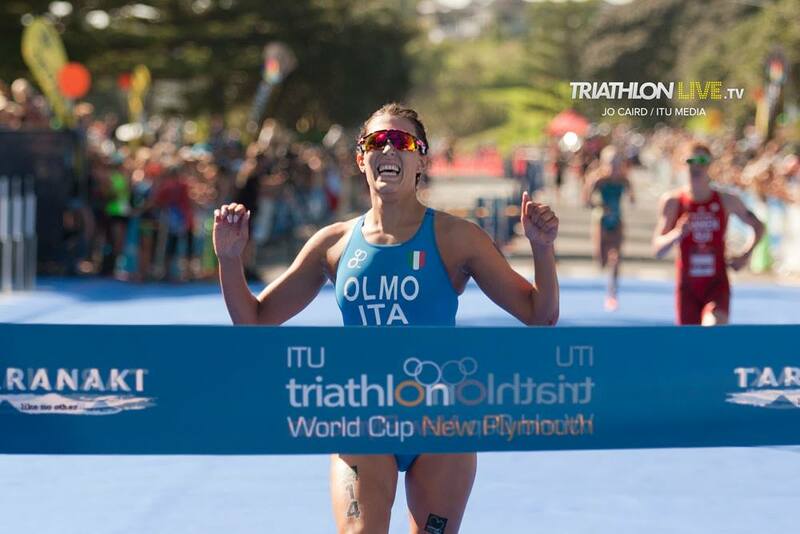 It was just enough to see the Italian storm onto the blue carpet to claim the gold medal, celebrating her first world cup victory and a career highlight on the coast of New Zealand. 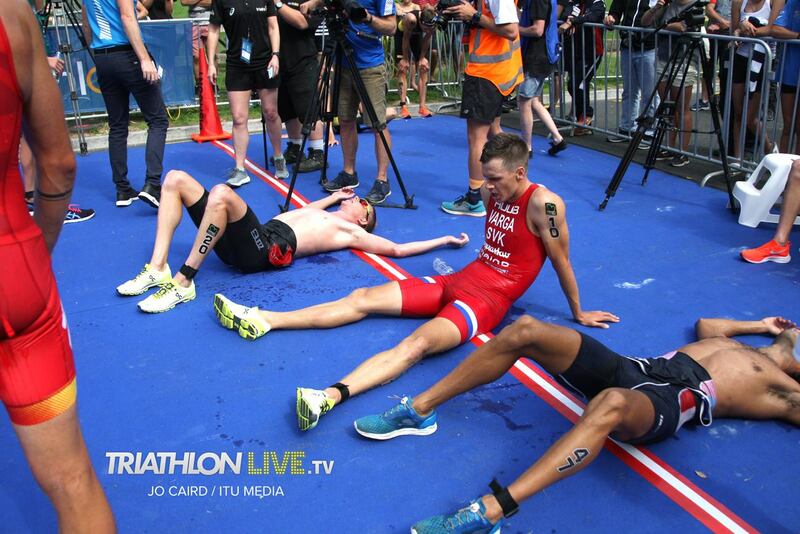 “I don’t believe it, I really don’t believe it. 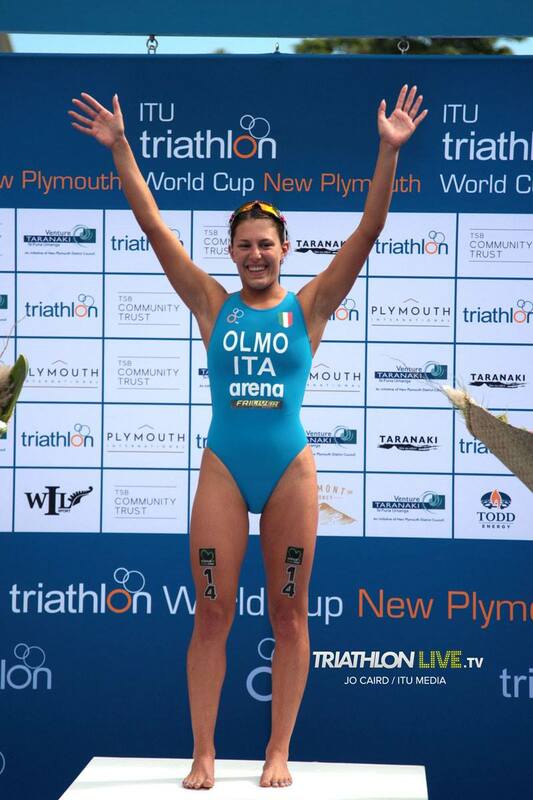 I was expecting to podium but not for the win,” exclaimed Olmo. 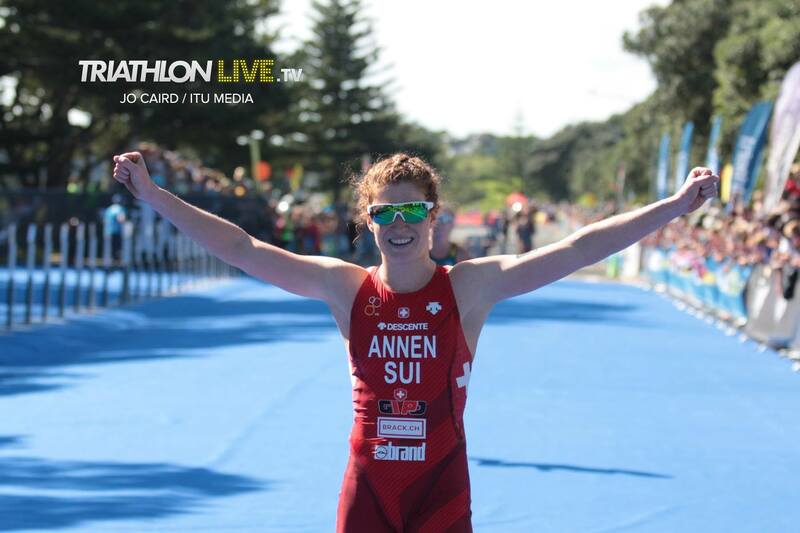 Annen showcased exceptional form across all three disciplines today to be awarded the silver medal. 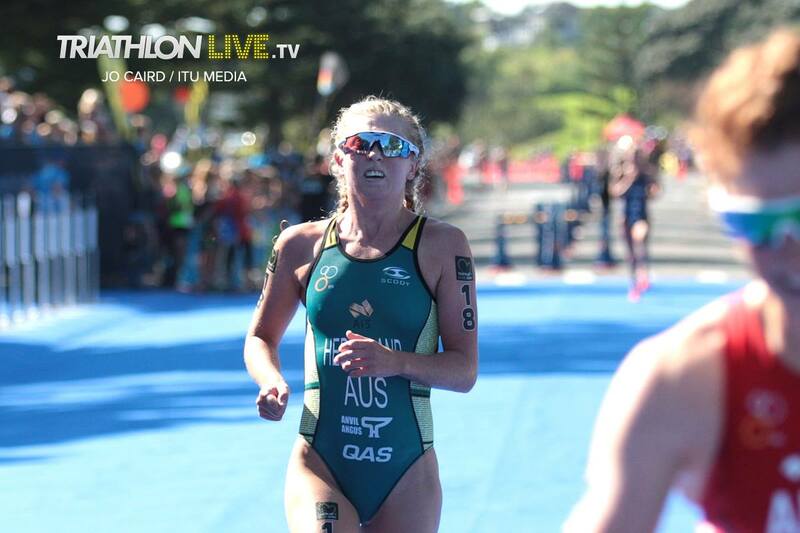 Australia’s Hedgeland had the race of her career to cap the women’s podium with the bronze medal. 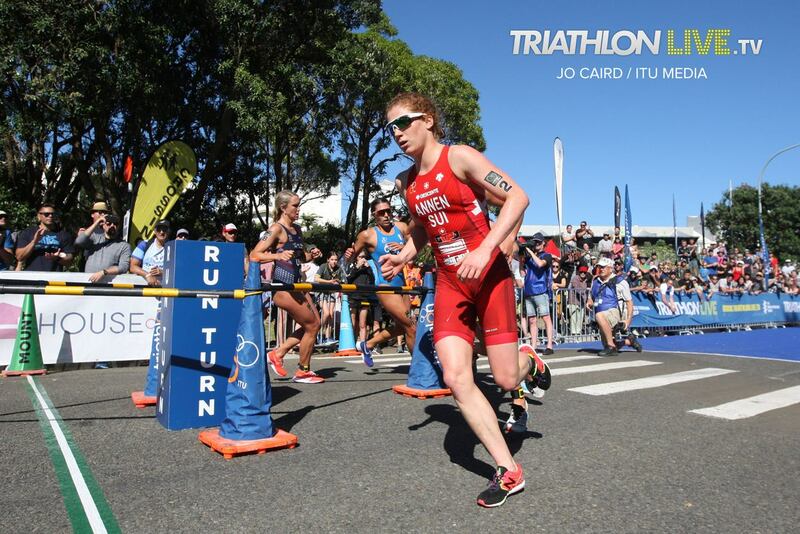 Gorman chased down fourth place and was thrilled with her performance and Jeffcoat crossed the line in fifth position.